ARCHANGELS is a company based in God's Country (beautiful sunny Southern California), dealing in Rare and Unique Paper Collectibles. We specialize in vintage Comic Books, Original Comic Book Artwork, Hollywood Movie Posters and other related items as well. We are Senior Advisors to the Overstreet Comic Book Price Guide and a Charter Member Dealer with the Comics Guaranty, LLC (CGC). For other wonderful items, make sure to visit us at our About Me Page. Namor the Sub-Mariner #19 Art by John Byrne. 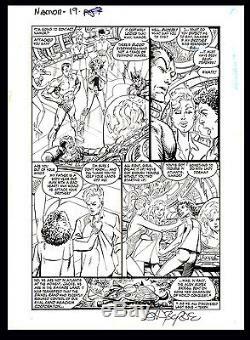 Nice original artwork for Namor the Sub-Mariner #19 (Marvel Comics, 1991) by fan favorite John Byrne (pencils and inks). Scene is from the story, "9 Wives" and features a beautiful full image of Namor and a close-up of him as well along with two nice images of his cousin, Namorita. Byrne artwork has been skyrocketing in value over the past several years and locating any reasonable pages from any of his books is getting more and more difficult. Page is in like-new to excellent condition with image size measuring 8" x 12" and signed by Byrne in the bottom margin. The item "Namor the Sub-Mariner #19 Art by John Byrne" is in sale since Sunday, February 08, 2015. This item is in the category "Collectibles\Comics\Original Comic Art\Interior Pages". The seller is "water-walker" and is located in San Diego, California.